Edgestar Stainless Steel 50 Lb. 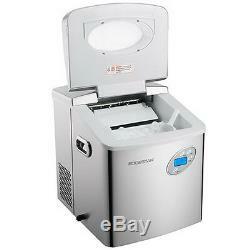 Large Capacity Countertop Ice Maker. 10-12 Min - 12 Pieces. 17.125"W x 17"D x 15H - 36.8 lbs. 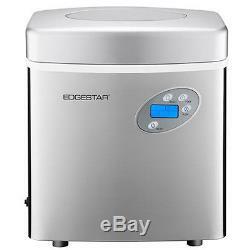 The Edgestar Stainless Steel 50 Lb. 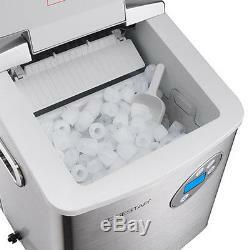 Large Capacity Countertop Ice Maker gives you ice whenever and wherever you need it. 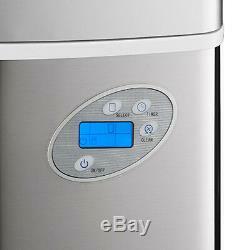 Durable, compact and portable, this attractive ice maker will more than meet your ice making needs. The compact, portable design is perfect for your RV, boat, or small kitchen and works anywhere there is a power outlet available. Wrapped in commercial-grade stainless steel, this portable ice maker is as dependable as it is attractive, complementing any contemporary kitchen decor. 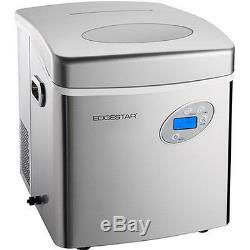 You can't go wrong with this Edgestar Stainless Steel Large Capacity Ice Machine! Compact & Portable: Perfect To Set Up On Counters Or Tabletops. Commerical-Grade Stainless Steel: Is Both Durable & Looks Great In Any Kitchen. Get More Ice: By Producing Up To 50 Lbs. Of Ice Per Day w/ a Bin Storage Of 2.6 Lbs. Large Water Reservoir: Holds 1 Gallon Of So You'll Spend Less Time Refilling. Fast Ice: Producing a Cycle of Ice Between 10-12 Minutes For Up To 50 Lbs/Day. 3 Ice Cube Sizes: Whether You Prefer Small, Medium, Or Large Cubes! LCD Control Panel: To Turn On/Off, Size Preference, Set Timer & Clean Mode. Warning Indicators: To Let You Know When To Add Water & Ice Bin Full. Easy Clean-Up: w/ Self Clean Function & Side Drain For Easy Maintenance. The item "Large 50 Lb Stainless Steel Countertop Ice Maker, Compact Cube IceMaker Machine" is in sale since Thursday, November 29, 2018. This item is in the category "Home & Garden\Major Appliances\Refrigerators & Freezers\Parts & Accessories". The seller is "fridge-plus" and is located in Saint Louis, Missouri. This item can be shipped to United States.